6 February 2018, 7:11 p.m. The well-related Darscape Princess went to another level at Tauherenikau where she led home an Auret family quinella in the feature event. 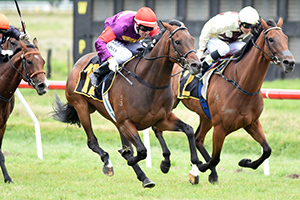 She took the rise in class from a Rating 75 win at Trentham last month in her stride to claim Tuesday’s Listed WRC And Pope & Gray Contractors Wairarapa Thoroughbred Breeders’ Stakes (1600m). Raced by her breeder John Bromley, Darscape Princess in a half-sister to stablemate and Gr.2 Auckland Thoroughbred Breeders’ Stakes (1400m) winner Sensible Princess, with the pair trained by Fraser Auret at Marton. He upstaged his Wanganui-based father Nigel at Tauherenikau with the latter preparing the runner-up La Fille En Jeu. “All I can say is I’m glad we didn’t come here in the same truck!” Fraser Auret said. Darscape Princess was ridden aggressively from an outside barrier by Johnathan Parkes to sit outside the leader and they hit the front early in the run home. “Halfway through the race I thought we would have no excuses today,” Auret said. The Darci Brahma mare had three-quarters of a length on La Fille En Jeu at the post with Bronsteel third ahead of Slimline and Asama Blue. “She flew the gates and travelled really nicely,” Parkes said. “She switched off and coming into the straight I had a handful of horse.” – NZ Racing Desk.